The Snug Cottage is a cosy 4 Star cottage in a quiet and convenient location very close to the town centre, in one of the oldest parts of Keswick. Great views of Catbells. It is beautifully furnished and decorated throughout. The cottage is double glazed and has central heating and WiFi. Ground Floor: Open plan lounge with a comfortable sofa, electric fire, flat screen TV and DVD player. WiFi internet included. 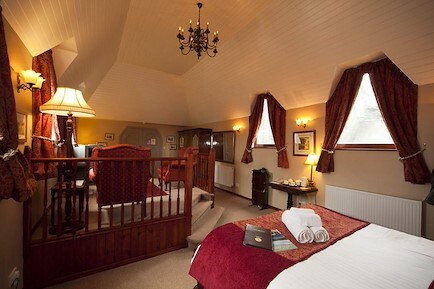 Upstairs: The double bedroom has a king sized Victorian style bed, wardrobe and other storage space. Views of the fells towards Catbells and the Vale of Newlands can be enjoyed from the bedroom window. The bathroom has a power shower over the bath, wash basin and toilet. You May Easily Check the Availability and Make a Provisional Reservation Online. I will contact you within 24 hours to confirm the booking. Deposit required to secure a booking is £100 per week booked. Mr and Mrs R Thanks so much for the lovely week we enjoyed at The Snug. L & J Our second stay at The Snug... As lovely as last time if not better. S & W Had a great break at the Snug, perfect place just for two. Would recommend it to our friends. A & W What a lovely cottage, everything you could need. Great views across to Catbells and Causey Pike. Love to come back soon. Mr and Mrs R Very comfortable cosy cottage. Great location close to everything in town. Hope to stay here again! M & A Perfect place for the two of us. Enjoyed having walks and the town on our doorstep. Your enquiry will be sent directly to The Snug Cottage Keswick. Please fill in as much detail as you can.